Love is in the air.. yaa all my fav rom com movies on air and am completely glued to my box. 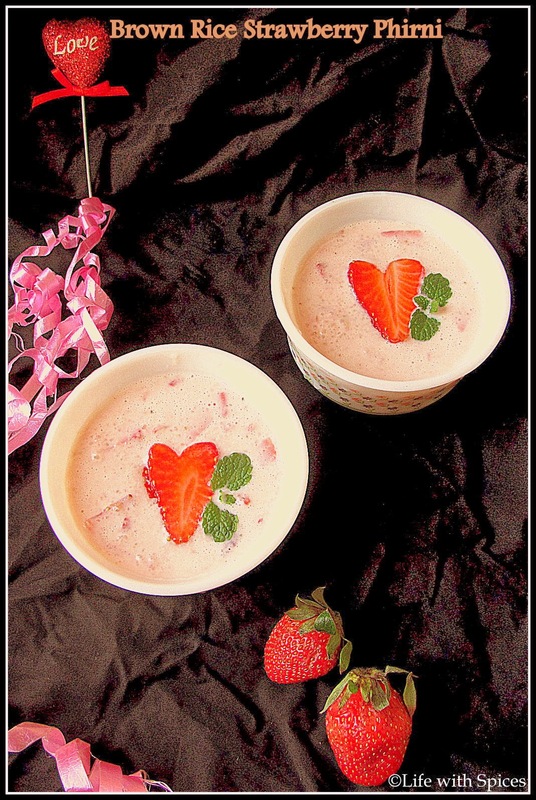 But still made this strawberry organic brown rice phirni with organic brown sugar n SH loved it.. Grind rice with 3 tbsp milk until paste. Boil milk in a heavy pan add ground rice and keep stirring it until the milk becomes half in quantity. Add sugar n rose extract mix it and cook till sugar dissolves. Remove from heat and let it cool completely. Grind 5 nos strawberries and chop the other half. Add the pureed strawberries mixture to the phirni mix well and add the chopped strawberries. Add chopped nuts and serve the phirni!! lovely phirni and nice color. Nice idea of adding strawberries. Phirni looks so good. Loved the addition of strawberries. wow love the brown rice addition totally nutritious :) love your healthy twists. Hope you had a fabulous V day! Who won't love this sweet creation, fantastic!